Preplanning is the key to weight loss diets in Beverly Hills. In order to brown-bag it properly, it is necessary to buy and prepare a large amount of produce about once a week and then there will be some type of healthy snack available when the munchies strike. The shopping is done and the fruits and veggies are in the grocery bags on the kitchen counter. Here is the first step. 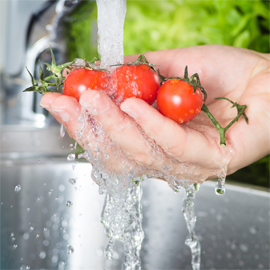 Always have some type of wash that is specifically designed for fruits and vegetables available in which to clean them. This may range from any number of citrus-based washes to the tried and true vinegar rinse. Clean the kitchen sinks, then fill according to the directions for the chosen cleaner. If using vinegar, use approximately ½ cup of vinegar to 1 gallon of water. Wash the fruits and vegetables first that grow hanging from a vine or tree such as apples, green beans, snap peas, grapes, etc. Then progress to the items that must be peeled, i.e. have a shell, rind, or skin, something that the outer skin will not be eaten. Change water as needed. Save the vegetables that grow from the ground for next to last, such as celery and green onions. Root crops such as potatoes and carrots are in a completely different category and should be cleaned at the very last, first the previous water and then again in a fresh wash. This will help remove grit and grime. The final rinse is very important. Rinsing after washing will remove any taste residue left by the chosen cleaning agent. Arrange all of the clean produce on a fresh tea towel to dry, then store in the refrigerator for future eating. This covers most types of fruits and vegetables but a few considerations should apply. For example, when washing and rinsing any variety of berries, leave the stem attached until they are eaten. This will prolong the life of the fruit. If there is a concern about lurking bacteria in the crevices created by the leaves, just swish them vigorously while washing them. Another thought should be about melon–wash any melons the same as other items. This will prevent any contaminants to enter the melon as the knife progresses from the outside inward. In addition, avocados and tomatoes should never be prewashed or stored in the refrigerator. This causes them to spoil more quickly.